Laundry....the battle that never ends. My laundry could be caught up and then can become overwhelming quickly. I'm always looking for a way to lesson the time it takes to wash our clothes. There are numerous products on the market for laundry usage. Stain removers, Detergent, Bleach, Fabric Softeners, Dryer Sheets & Bars, and much more. As some of you may have noticed, I am partial to the Purex brand. Purex has several products on the market to choose from. So far I have been pleased with all of their products we've experienced. I do have my favorite Purex products and tend to lead toward my favorites at times. Purex plus OXI is one of my go to detergents. The fresh scent is not overpowering and lingers after the laundry is finished. While I am partial to stronger scents, some can arouse seasonal allergies or headaches. Purex with OXI hasn't caused this issue in my home. 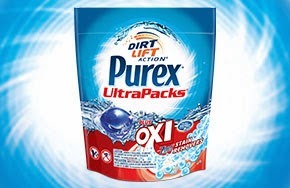 Purex plus OXI is now available in easy to use UltraPacks. The Purex UltraPacks plus OXI fights over 101 tough stains. This product is infused with Zout stain removers which creates an easy to use product. Just toss one or two packs in the washing machine and go! How easy is that?! I have to admit that I never properly measure my liquid detergent. This usually leads to my having to purchase a new bottle sooner than I would if I did measure. The UltraPacks contain a full load in one pack. Use two UltraPacks for large or heavy loads. You can definitely see how someone could save money by using UltraPacks instead of liquid detergent with a measuring cup. An added bonus is not wasting detergent by spills. The UltraPacks are sealed and dissolve in water. "Remember to use caution when handling single load laundry detergents. Laundry detergent packs may be harmful if swallowed and can be an eye irritant. Be sure to keep products in the original container and pay close attention to any cautionary statements or icons on the label. As you would with any household detergent, be sure to keep out of reach of children." I haven't had any stained laundry to wash since receiving these UltraPacks. I cannot offer any opinions on how well it fights stains. I can mention that thick dirt has frequently made it to the dirty clothes basket. I'm sure this will continue as hunting season approaches. The detergent has been quite helpful with removing the dirt while leaving my clothing clean and fresh. Paired with Purex dryer sheets, the lingering scent lasts a few days after being put away. Another tip to soften your laundry and add an extra hint of fragrance is to use Purex with crystals. I'm a huge fan of these extraordinary crystals. The instructions state to use a specific amount, but I don't measure them. I shake a few in with the towels, linens, or other materials that could use a bit more softness. Disclaimer: I received a sample of Purex UltraPacks in exchange for sharing about the product with my readers. All opinions are my own and unbiased. I also received 3 coupons that have been distributed randomly.